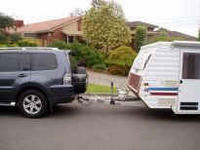 So, then........ Just what is a GOOD TOW VEHICLE for a small caravan? We set about to solve the problem for the working family man, who can't afford the luxury of two vehicles, but wants a comfortable, affordable, work-horse for the holidays, that carries up to 5 people, has secure internal wagon space, and is brilliant to drive 9-5 around the suburbs as well! Tall order, but the results speak for themselves. We're not talking any really serious off-road stuff here, but caravanners still like to reach some interesting off-road locations like the rest of us, let's face it. But the real concern is - do you need to own two vehicles? For the average traveller spending most of the year around the suburbs, driving a truck, is an uncomfortable, uneconomical experience. If you only have a small, single-axle, pop-top caravan, say over 1000kg - 1200kg, and need a vehicle for other day-to-day usage around town, then the choices become a bit tricky....... Let's assume the all up weight including your food and belongings, comes to a low 1300kg - 1500kg. In our case, a Gazal little Nova, but it could be any 12'-15' poptop styled caravan. But there are lots of 15'-17' vans weighing in at around 1800kg too, so they're well covered by our findings in this article as well. If you're pulling a larger van, dual-axle, over 2300kg, or if you want to do some really serious white knuckle 4WD'ing, then you probably need a Nissan Patrol or Toyota Landcruiser. They'll do the job nicely in the scrub, and tow your big rig there with ease - but they're a total waste of time around the cities if you spend a lot of mileage in those areas too. Unless you are a tradesman, or have a specific need for a ute-styled vehicle (for motorcylces, pets, or other external storage), then we've also left the crew-cab 4WD type vehicles out of the exercise. But we would hasten to admit, that if this shaped vehicle is for you, then for towing purposes, an honorable mention must be extended to the likes of the Toyota Hilux and the Nissan Navara, as these are ideal towing vehicles and can handle off-road work with ease. But they may not suit the suburban dweller seeking a more station wagon styled unit. That's what this article addresses. We looked at the practical and technical issues often overlooked by people who think towing is a matter of just putting the van onto the towball. 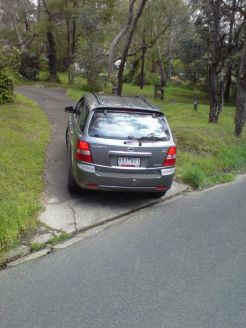 We'd highly recommend that if this is you, then it is time to take a course on towing and awareness of the safety aspects when sitting at 100km/h towing what is trickier than an articulated vehicle - particularly with family onboard, and an obstacle confronts you in the dark, when wet and at high speed. Does your choice of vehicle cover the risk of that eventuality? What we uncovered was much more. Traction control, decent low down torque for towing, economical running around town, easy parking, and creature comforts all came into the equation. Not to mention price, overall running costs, future service costs, and resale values. And we were surprised at what was missing on some of the big-ticket vehicles offered today. So much so, stay tuned for an article on traction control, ABS, ESP, and similar technologies in the future. PLUS: we've included a check list of negotiable points you should ask the salesman! Kia - a treat for towing! ...... from a 'towing' point of view. efficient diesel engine. A "common rail" simple, reliable design. a way of avoiding getting bogged - the right type of diff(s). ability to drive all four wheels - not just both tail shafts! How much to spend? $30K, $40K, $50K, $60K or nearly $70K? On paper, the tested models offer a solution, at each of these price levels. 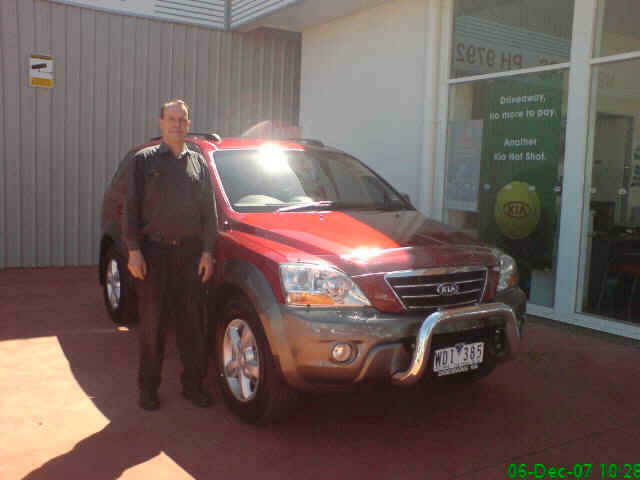 So...... Can say, a KIA Sorento EX, Diesel, (5sp Auto) step up to the task? Here's what we tested and experienced. Deep gutters, losing rear end traction. 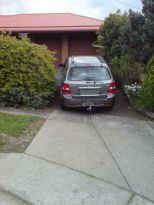 Steep driveways causing towball bottoming out. A Low towball preventing you leaving hitches on. extending towbar tongues that reduce departure angle ! By the way: Does our own HITCH KIT fit the new car? 50x50mm shafts vary from different car makers! We have a genuine Hayman Reese from the last car, and the caravan has been setup with three jockey wheel connectors and gas bottle located to suit - so we don't want to change all that again! What have you already invested in? In the end, you will need to have servicing and you will undoubtedly need to talk about adding things like UHF radios, towing brake controllers, hands-free kits, RDFS radio, shelving, cargo protectors... and so forth. In our case we also wanted additional wiring for special communication facilities (ABSoutback3). So a good relationship with the dealership you finally do business with, must be a balanced decision based not purely on initial costs, but, courtesy, service and future costs. So obtain 3 or 4 quotes, meet the service manager and their team - and talk to existing owners of the car you are looking at. 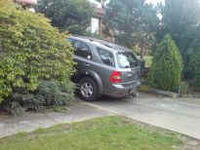 Particularly, talk to owners that have used one for say 100,000kms to see how they've gone. Forums on the internet are an invaluable source of information, but be sure to follow up any unusual information that may be an owner-error. Okay, so you probably want a good deal on your next tow vehicle. Are you eligible for a fleet, or ABN discount for purchase? Document to the dealer, what you intend to use the vehicle for. Then you can compare the value of their servicing/warranty offers. Clearly document and compare all the options you want. Towbars, wiring, tinting, protection strips, nudge bars etc etc. It all adds up. Be sure to get estimates of future servicing costs (say 3-5 yrs). It is the major services, and the intervals that must be clearly compared. Pinpoint items like timing chains versus belts - be sure you understand whether these are a serious cost item or not. Check that the dealership quotation lists all your options and also outlines estimates of future servicing costs - no surprises! Take note of any trimmings - like a free tank of Deisel - its all your money! Compare the on-road cost - with GST, stamp duty, rego, TPI and D/Del. Then consider the adjustment for any trade-in - shop around or sell private. So.... what's available on the market? NOTE: we've deliberately left out Toyota Landcruiser and Nissan Patrol, on the basis that the caravan being considered is well under 2800kg, single axle, and there is no need for really serious off-road 4WD activities. These two fine heavy-duty vehicles are considered overkill for the comparative needs under review in this article. They also represent a style of vehicle that we believe is uneconomical for non-towing day-to-day use around the suburbs. 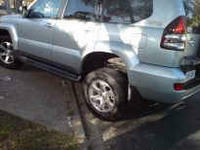 Pros: proven, excellent wheel travel, good gears/diff abilities (4WD-L). Tank: 180L. 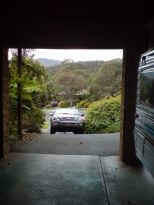 Cons: most expensive, rear door opens outward, has wheel on door, No security blind for rear cargo (not even an option). Length: 4850. Turning: 11.4m. 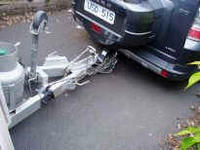 Towing: only 2500kg - small for its size. good rear-door setup (rises), ABLS and LSD. ABLS does NOT work when in 2WD. ABLS is only applied to REAR wheels. Awaiting confirmation if ABLS works in 4H. Tank: 88L. Favourably priced against Pathfinder and Prado. Cons: rear door opens outward, with wheel on door. Test vehicle went into ECU limp mode, requiring return to dealership to reset. Note: For caravanners: If you are backing a van onto wet slippery grass with the front wheels still on gravel or tarmac, the EX model still has traction control on the front wheels too, which means you can use the torque and traction on any remaining front wheel to still move the vehicle into position on the wet grass! Great advantage! Note: In 2WD, if you manually choose to de-select ESP, then you lose Traction Control too. But just don't de-select it! 4H to 4L via switch. Traction control in 4H or 4L leaves full torque if needed. Super low speed (4L) down-hill assist - great! Servicing outlets in country areas. (yet say, VIC has 45 dealerships versus Nissan who has 46 - so check the locations). Slightly firmer ride, but to be expected for a live rear-axle - worth it for towing ability. Pros: small size, good price, 400Nm @1800-2400. Towing: 2800kg / 280Kg ball. 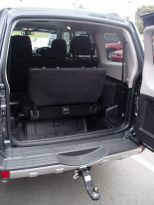 ride, side opening rear door, spare on door. Cons: only 1600kg towing. 276Nm @ 4000rpm. No deisel. Pros: Nice car to travel in - but undersized for towing. Price for non-premium model. Cons: AWD is FWD. No LSD or Assisted braking. Viscous Coupling. 6cyl is only 1800kg towing capacity. Very expensive for Premium models. No deisel. Cons: FWD bias with its AWD design. 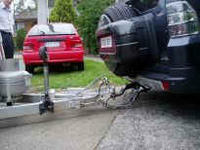 Towing only: 1700kg for diesel. Cons: no 6 cyl. no low torque. AWD is FWD. Viscous coupling. Note: In our caravanning travels, Hilux and Navara both feature very highly, but you need to decide if you want a UTE type shape. An honorable mention should be made for the FORD BA Sedan, which is a well known and respected tow vehicle, but the writer's needs are for a 'wagon' shaped vehicle to suit day-to-day business use. ** availability of demo vehicles with proper 50x50 Hayman Reese type towbar, 7-pin wiring and brake controllers. and as such may not reflect the requirements of all readers. The topics and points raised are for the purpose of illustrating the many variations in designs and features offered by car makers. Additional research was often needed to find out more about the capacity, mechanical operations, suspension and 2WD/AWD/4WD methodologies of the models considered. This required calls direct to the manufacturer themselves, in order to get additional technical information. All errors or omissions excepted.